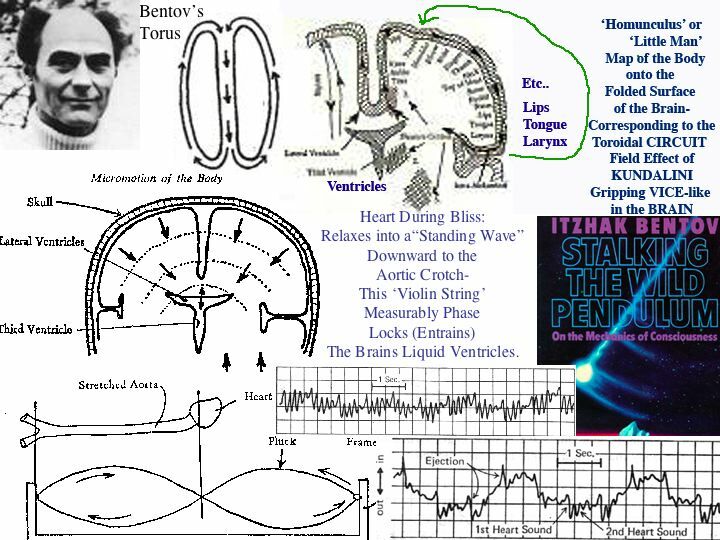 Every Spiritual / Consciousness Training / Psychological Counseling + Biofeedback Manual has Reiterated that to EVOLVE and GROW we must learn to link our HEARTS TO OUR HEAD. 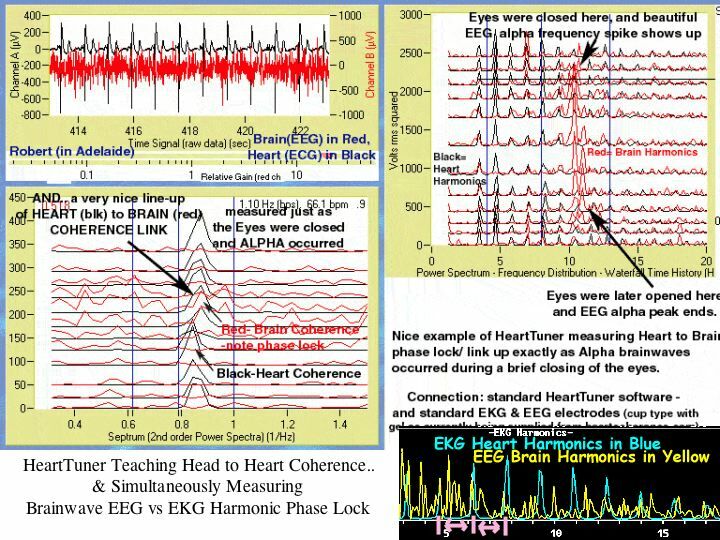 NOW - for the very first time- there is a dramatic BIOFEEDBACK Environment (the world's first and only) to MEASURE and TEACH this connection : The new Brain-Heart software module JUST ADDED to the complete HeartTuner / BlissTuner System - with TWO ways of TEACHING by MEASUREMENT the Brain-Heart Connection: a) phase lock between measured EEG vs EKG harmonics (simple spectra compared)-top right of picture , and b) observing when the internal COHERENCE history /Cepstrum amplitude PEAKS LINE UP from EEG vs EKG- bottom right of picture. 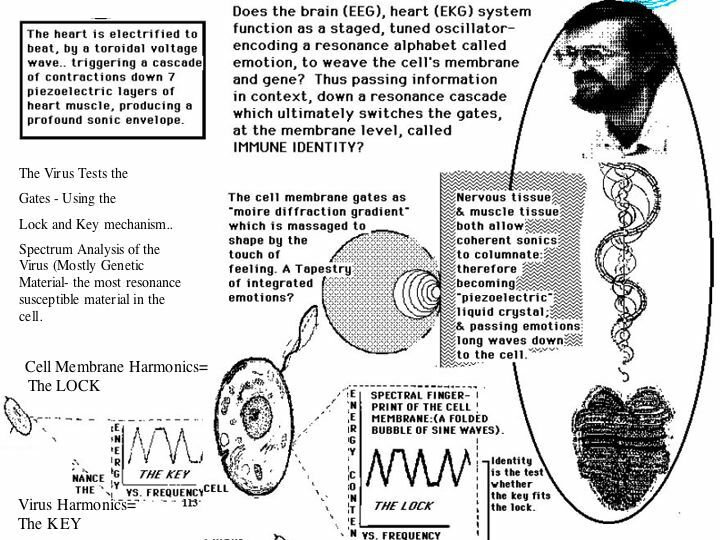 A New Scientific / Biofeedback BreakThru - from HeartTuner / BlissTuner , invented by Dan Winter. Dan Winter complete conference introduction to Science and Consciousness AUDIO- Part 1 + Part 2 - exerpt from the complete London/Kingston Nov 06 Conference (thanks to Christian Kyracou) >with accompanying powerpoint image set >. also NEW> Dec 06 COMPLETE REMOUNT EXPANDED UPDATE- Dan Winter's presentation - 420+ Image IMPLOSION POWERPOINT newest online version! 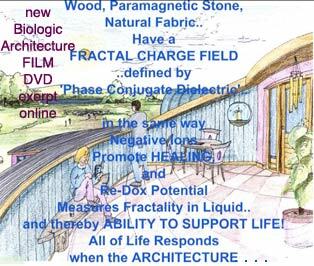 + more from Michael Rice - from Ireland - featured in the film - with drawings and examples at holisticarchitecture.com AND the new (opening this month)- biologicarchitecture.com many more links and partners in Biologic Architecture - from around the world..( notably Mexico: psicogeometria.com ) are at goldenmean.info/architecture (link above). -HeartTunerPRO Special- Including 2ch HRV + BLISSTUNER EEG 2ch now with TWO Ways to Measure Empathy with special TRAINING , SUPPORT, - with the new 2 channel HRV/Empathy system- the price has not increased: 1575 Euro / 1064 GBP. Complete HeartTuner Input Preamp Hardware w/USB, 2 sets EKG + EEG Electrodes- Complete HeartTuner PRO Software Environment -Plus- Free Gift- TRAINING! - if you order thru the Inventor- Dan Winter- Complete 25+ DVD Video Set including 7 disks on HeartTuner/ BlissTunerTrainings (from goldenmean.info/tools ) +3 Books of Dan Winter including Ecstacy&Immortality Book - Complete Hardware Warranty & Support from Inventor of HeartTuner -- To Order:-email (your Visa/MC info+ship to) or PAYPAL to: danwinter@goldenmean.info -U.S.phone: 310 651 8123 | The HeartTuner / BlissTuner System ( thanks to software development with Frank see goldenmean.info ) - offered here - with Support from the Inventor+ Training DVD's.. - HRV / Breath / Cardiac Synth -goldenmean.info/heathmathmistake + measure BRAIN-HEART Linkup! Note- we actually played the famous "Angel Music" from our friend Punit - (CD's of Angelic Healing Music) to MAKE some of these recordings..
We recommend Punit's spiritually inspired music at - to help MAKE the Brain - Heart Connection. 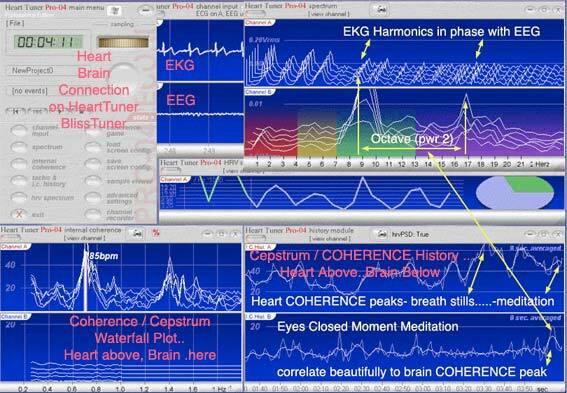 Below we see an example of the earlier version of the HeartTuner Pro software showing the MOMENT at which meditation begins- where the beginning of the alpha (red peaks at 10.5hz) correlates with a moment where the COHERENCE of Heart vs Brain links (bottom left waterfall plot graph of cepstrum / coherence compare of EEG /red vs EKG black). Note from Dan: we have spoken often with Douglass White , http://www.dpedtech.com/OPdex.htm about "observer physics" . The ability to self refer (observe) is most in essence in a wave of charge able to non destructively self reenter--(golden spiral) exactly like charge compression waking you up in a lucid dream precisely because of what looking at your hand causes electrically... (tightening the slip knot of the electrical toroidal tornado.- see Bentov's pic of the toroid magnetic circuit HOMUNCULUS around the brain circuit fractally in phase to the map on the body - triggering kundalini - above.